We’re glad to announce that Papyrs is also available in theÂ Google Apps Marketplace! If you are a Google Apps user, you can now add Papyrs to your Google Apps domainÂ directly from the marketplace. With Papyrs you can easily build an intranet for your team using drag & drop, and use it to collaborate better withÂ colleagues and clients.Â Easily create pages with rich notes, documents, images and much more to share all your information. Add custom online forms to collect data and process requests.Â It’s allÂ very easy to use, so there’s no technical knowledge required! 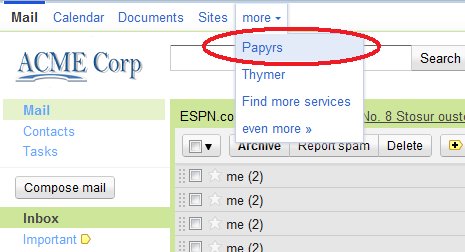 Start using Papyrs with your existing Google account (Single Sign On); no extra log in or account required! Navigate between Papyrs and your other Google apps using Google’s universal navigation. We’re happy to add Papyrs to the large family of useful apps in the Marketplace, and hope it helps Google Apps users to be even more productive. Already added Papyrs to your domain? As always, we’d love to hear what you think: comments, suggestions and questions are always welcome!